UK: The Central Front On The War On Terror? Think the UK's experiment in diversity and multiculturalism has been a grand success? If our cousins across the pond don't soon reject multiculturalism, and once again embrace their Christian roots: The UK will one day replace Iraq as the central front in the War on Terror. Giver of our hard-earned dollars to fight the ills of the world. Extender of an olive branch to the lit fuse of Iran. Former Muslim who decides to reconnect with his roots. Aaaaahhhh...imagine...sounds like hope to me! Sderot is an Israeli city of about 22,000 residents. Since the second intifada (Sept. 2000), this little town has been brutally attacked by 'Palestinian' terrorists daily. Close to 7,000 rockets have crashed down upon innocent Israelis, and among these residents are terrified children. The children of Sderot live in fear day and night of the monsters in Gaza. And these monsters are not imaginary. Yossi Haimov, 10-year-old Sderot boy, sustained serious injuries when a Qassam fired by 'Palestinian' monsters in north Gaza, landed near a school in Sderot. As the children awaited the Magen David, Yossi's 8-year-old sister, Maria, caressed the face of her brother, while he lay wounded on the ground. Are these the kind of people anyone would want for neighbors? Well, if Israel gives into pressures for a 'peace' agreement, they will be giving into these monsters...and the nightmare for Israel's children will never end. It's time for all good Jews and Christians to cry out against the 'Palestinian' terror perpetrated upon the most innocent...and stand in the gap for the children of Sderot. Relegate the monsters back into the shadows...where monsters belong. Is Islam compatible with democracy? Not according to a recent study conducted by the Washington-based Center for Security Policy. So, the next time an unctuous, boot-licking politician tells you that Islam and democracy are compatible: Start laughing. When you strip away the towering oratory and slick slogans, Barack Hussein Obama is nothing more than a smooth-talking, radical-liberal. tax-payer funded initiatives has placed him to the left of Teddy Kennedy. More disturbingly is Obama's acquiescent attitude concerning terrorist regimes. On more than one occasion the senator from Illinois has waxed eloquent about his willingness to dialogue with the leaders of Iran and Syria. 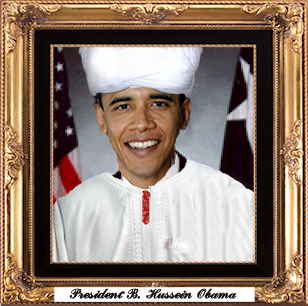 Truth is, an Obama-nation would be a socialist utopia that pays unwavering homage to Tehran and Damascus. 'Old Gray Lady': Boo-Boo Woos The Base? How? Well, there are many conservatives who are not happy with McCain for several reasons (i.e. Campaign Finance Reform, no waterboarding for enemy combatants, closing Gitmo, etc. ), but they just happen to disdain the NY Times far more than they dislike McCain. And this unequivocal fact could collect conservatives right into the McCain camp. Thanks to the 'Old Gray Lady'...McCain's work to woo the base may have just been accomplished. The UN Undersecretary-General for Humanitarian Affairs, Sir John Holmes, visited Sderot as well, but strangely enough condemned the "indiscriminate" targeting of Israeli civilians. "Indiscriminate?" As opposed to what exactly? Purposeful targeting of Israeli civilians? But Holmes didn't stop there. He warned, in true UN form, Israel against taking retaliatory military action. You know the kind that is necessary to the national security of the Jewish State. The targeting of terrorists plotting or carrying out the rocket (and other terror) attacks, as opposed to targeting innocent civilians as the 'Palestinians' do. No demands upon the 'Palestinians' of their heinous attacks, but rather...as in the hundreds of UN resolutions concerning the Middle East conflict in the past...condemnation of Israel. And if that wasn't egregious enough, Holmes insisted that diplomacy was the only way to solve the problem. Apparently, Mr. Holmes is unfamiliar with the failure of diplomacy since the re-birth of the Jewish State, where Israel surrenders its land, and receives maimed and murdered innocent civilians (due to 'palestinian' terrorism) in return. But are we really surprised by this behavior from a member of the leadership of the UN? Not really. Because there is one thing Israel can count on: The UN is Israel's forever foe. Suicide Is Wrong: Long Live Suicide Bombers? Islam supposedly forbids suicide (Quran 5:32), but when it comes to the suicide bombers entering Israel and killing innocent Jews, it's not only OK, it's preferred. They are known as shahids or martyrs. They have tournaments, streets and parks named after them. Confections are distributed in the streets, as Muslims dance and celebrate. Mothers long to have many sons to give up as shahids to Allah in order to kill the infidels. According to FrontpageMag.com, 'Palestinian' terrorists have been igniting themselves, as 'suicide bombers' and 'homicide bombers', since April of 1994, at which time 5 Israelis were sadistically murdered on a bus in Hadera, by a 'Palestinian' shahid. And more than 150 'Palestinian' suicide attacks have since occurred. Notice the Quran says, "unless for murder or spreading mischief on earth," Muslims consider the Jews and Christians in particular, and all other infidels in general to be guilty of murder of Muslims and 'spreading mischief on earth' therefore they have a right to murder us. They are clever enough to know that telling us this would prevent them from carrying out there deeds, so they have the paltering version for the infidels and the truthful version for the Muslim brethren (just check out the many sermons, preached in the Muslim world, at MEMRI TV). So, is suicide bombing wrong? We know the right answer, but we need to be concerned whether our Muslim neighbors are using the same playbook. One thing is for certain, John McCain will bring the Iraq war back to center stage during the general election. This--of course-- will be to the great dismay of either Obama or Clinton who are both in disturbing denial over the great success of the Surge. Look for McCain, with strident passion and accuracy--to take the Democrat nominee to task over such a disturbing denial. A BBC correspondent, Humphrey Hawkesley, in a BBC World report following a memorial rally for Rafik Hariri and Mugniyah's funeral, concluded: "The army is on full alert as Lebanon remembers two war victims with different visions but both regarded as great national leaders." "For you to refer to former Prime Minister Rafik Hariri and Imad Mughniyeh as 'great national leaders' in the same sentence is beyond belief. One was an elected leader who spent years and millions of his own money rebuilding his country. The other was probably the world's second most notorious terrorist, who was responsible for, in addition to running a major criminal enterprise, destroying the US Embassy, the French and US Marine barracks in Beirut in 1983; the hijacking of TWA 847; the bombing of the Israeli cultural center in Buenos Aires, [and] the kidnapping and murder of many Westerners in Lebanon, including Terry Anderson, Terry Waite, John McCarthy." Mr. Mell's letter prompted the BBC to proffer up a paltry apology, which had traces of ignorance or perhaps an odor of disingenuousness. So, just in case 'the Beeb'* skipped over the history of some of Mugniyah's acts, here's a list to help their research department. Was trained by Arafat and the PLO in Lebanon in the early 80's. Was responsible for the bombing of the American embassy in Beirut in April 1983, which killed 63 people, including 17 Americans. Planned the October 1983 twin attacks on the American and French barracks in Beirut, which killed 241 U.S. Marines and 57 French paratroopers. Was responsible for almost 100 Western hostages being taken, between 1982 and 1992, including 25 Americans, 12 Frenchmen and 12 Britons. The longest-held, former AP correspondent Terry Anderson, was abducted in March 1985 and released in December 1991. Was responsible for the murder in January 1983 of Malcolm Kerr, president of the American University in Beirut—where Imad Mugniyah had studied engineering. Was involved with the torture and killing of William Buckley, CIA station chief in Beirut, in 1984. Was responsible for the hijacking of TWA Flight 847 in June 1985, upon which Robert Dean Stethem, a U.S. Navy Seabee diver (one of 40 passengers), was brutalized, executed and dumped on the Beirut Airport runway where the TWA plane sat for two weeks. Was responsible for the bombing of the AMIA, a Jewish cultural center in Buenos Aires in 1994, which killed 85 people. The BBC's stated mission is "to inform, educate and entertain"...the first two are clearly accomplished in a biased manner flattering to the oppressors of freedom. And what's left (entertain) isn't worth a second of our leisure. *'the Beeb' - BBC's nickname. 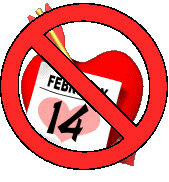 A celebration of 'LOVE' is Haram in Islam, or 'forbidden'. Yes, that's right, the religion that is touted by the ignorant as a 'religion of peace and love'...just ain't. Throughout the Muslim world, including Egypt, Pakistan, Bangladesh, Jordan and Kuwait...the day celebrated in the West representing love is anathema. Islam dictates that no infidel (that's us) holidays are to be celebrated. Yet Valentine's Day is spreading like wildfire in the Muslim world despite the bans. I guess all their hate- filled draconian rules just can't defeat LOVE. And the reason is...LOVE is not found in Muslim ranks and won't obey their laws...it originated with the Judeo-Christian G-d...the G-d of the Bible...the G-d of Israel. And that's anathema to Islam. According to Ha'aretz, our US administration is now urging Israel to engage Egypt in instantaneous discussions to find a shared solution to the problem of the breached Gaza-Egypt border. Our government wants Israel to show some flexibility concerning Egypt's demand to add 750 soldiers to its border force, as well as to agree to 'palestinian' PM Salam Fayyad's offer to take over responsibility for the Israel-Gaza border. First of all...the only party that has been 'flexible' on any negotiations, is Israel. The Arab 'partners' in this process will not concede a thing (following in their dead leaders footsteps, Yasser 'all-or-nothing' Arafat). Second of all...we have already forced Israel to hand Gaza over to the 'palestinians', and they have taken millions of US and foreign aid and turned Gaza into a launching pad for daily violent attacks on Israeli civilians. Third of all...since the Camp David Accords in 1979, the Egyptian gov’t may not have directly attacked Israel, but they have assured the passage of arms to be used against Israelis. The Egyptians have continually allowed weapons to go from Egypt into Gaza, including suicide bombers (as we’ve seen recently), with what I believe is the full complicity of the Egyptian gov’t. So Israel must allow Egypt to add 750 soldiers to Egypt's border force? And the 'palestinian' PM Salam Fayyad's offer to take over responsibility for the Israel-Gaza border should be welcomed? Is that to insure safer passage, and more precise directions, for suicide bombers? Are we 'useful idiots' or what?! It is long past time for us to exit this egregious 'peace process' we have been shoving down Israel's throat for decades. The best way to help democracy in the Middle East is to support Israel (the only democracy in the Middle East) with logistical and pragmatic assistance. Israel has G-d on its side. They can handle their own affairs (as history proves). The Obama campaign is, without question--a juggernaut. And that is a chilling reality. Because the senator from Illinois--who touts himself as an agent of change--truly believes that he can assuage Islamic despots and terrorists (think Ahmadinejad) with his lofty and hope-filled oratory. And, unfortunately--so do the throngs that are literally mesmerized by his silver tongue. In a highly dangerous and volatile world (with America facing a psychotic, Islamic enemy): 'The Audacity of Hope' will have devastating consequences. Homosexual activists and their advocates continue to be the most selfish, rabid and unpatriotic pack in America. Boy Scouts (last year) from a facility in Philadelphia that they were renting for one dollar a year for nearly a century. The city demanded that the scouts pay market value ($300,000 a year) unless the organization forsakes its policy barring openly gay scoutmasters. Imagine--evicting the Boy Scouts: Pack of wolves. Once we get beyond John McCain’s politically expedient acceptance of the Bush tax cuts, we must ask ourselves the following: Will the senator from Arizona (given his servitude to the gods of global warming) retool (eviscerate) our economy in order to combat ‘catastrophic’ temperature variations? Remember, the purpose of Kyoto (as stated by President Bush) was to cripple the American economy. And given the undeniable fact that McCain is a committed greenie—we should be very concerned. John McCain: Too green for the job. that Islam is a religion of peace and tolerance? conversion to Christianity are punishable by death in most Muslim countries. sedated to the virulence of the religion of peace and tolerance. Our cousins 'across the pond' have finally gone barmy*...their government has officially renamed Islamic terrorism as 'anti-Islamic activity'. You are now entering the UK...please check your brains at the door. British Home Secretary Jacqui Smith said that extremists were behaving contrary to their faith, rather than acting in the name of Islam. With all due respect, Sec. Smith, have you cracked a history book lately? From its inception, Islam, led by its bloody leader Muhammed, has left a path of barbarism and terror upon every bit of sod it has invaded. Terrorism is not only Islamic...Muslims have perfected its techniques to give us the gore we are now terrorized with today. Perhaps Ms. Smith is unaware of the news reports (including video) worldwide of Muslim men, women and children rioting when anything is said or written about Muhammed by an infidel (that's us)? Calls for death by beheading and dismemberment can be heard by crowds and seen on signs from the weekly parishioners of local Mosques. Not a scene you'll ever see coming out of Judaism or Christianity. Is the British public asleep? Where are the descendents of the 'greatest generation', who would never have tolerated this kind of appeasement by their leaders? It's time for the lovers of freedom in the UK to arise and put a stop to this spineless, dumbing down of the population in order to appease a dangerous enemy. It failed when British PM Neville Chamberlain tried to appease Hitler...and considering Hitler had a great admiration of Islam and conferred with the Mufti of Jerusalem on the 'Final Solution'...this official move will fail as well. According to Y Net News, upon word of the suicide bombing in Dimona Monday where an innocent Israeli woman was murdered and 8 others seriously wounded, Gaza residents (palestinians) burst forth in revelry. They were treated to festive wreaths of flowers, as well as confections that were handed to drivers and passers-by, and drivers honked their horns in glee. A Hamas representative thanked Allah that the attacks were successful and called the attacks a glorious sign. Barbaric is not a strong enough term. How do you become friends with people who find their entertainment in innocent civilians being blown to smithereens? Will their welcome wagon include a fuse? If their definition of 'good' is humanity's definition of evil...we've got a worldview problem that takes precedence over any peace agreement. whether she would garnish the wages of those who could afford health care (but refuse to contribute to her universal health plan) she stated the following "we will have an enforcement mechanism -- whether it's that (wage garnishing) or it's some other mechanism through the tax system or automatic enrollments." Make no mistake: A vote for Hillary Clinton is a vote for Karl Marx. According to WND.com, a high-level Muslim Pentagon aide, who led an operation to silence a Pentagon intelligence analyst, Maj. Stephen Coughlin, for taking a hard line against Islam, is running an "influence operation" on behalf of US Muslim groups fronting for the Muslim Brotherhood, a global jihadist group based in Egypt. Hesham H. Islam, a special assistant to Deputy Defense Secretary Gordon England, lodged complaints about briefings Coughlin prepared for the U.S. military warning that major US Muslim groups were fronting for the Muslim Brotherhood. Coughlin's facts were correct, but apparently England couldn't be bothered with that...he allowed Islam to forge a campaign against Coughlin, one might say, a hate campaign in as much as he referred to Coughlin as a "Christian zealot with a poison pen." Sounds like bigotry to me. And Islam's close personal relationship with England assured that Coughlin's contract would not be renewed. WND also reported that a senior US official, who has met with England, says England was not even aware that a convicted terrorist and al-Qaida fund-raiser (Abuhena M. Saifulislam) established the Pentagon's Muslim Chaplains Corps. And an FBI official warned that the Muslim advisers are part of a conspiracy, by Muslim Brotherhood fronts, to run "influence operations" against the US government inside the US government. Having such pernicious characters so close to our military is astounding and terrifying. With all due respect, Mr. England is being a useful idiot for those who are hiding behind our love affair with appeasement in order to destroy every vestige of the freedoms of the West. Should we be afraid? You bet. Should we remain complacent? Not on your life. If we do, it will surely lead to our ruin...not to mention the dismembering charm of Sharia in the Halls of Congress. True, John McCain was right about the Surge. But beyond that--he is mired in a mental abyss. From McCain-Feingold to amnesty to whining for the closure of Camp Gitmo, the senator from Arizona has more than demonstrated his radical, liberal bent. His maverick positions--while delighting those on the Left--have incensed members of his own party. Including twice voting against the economically critical Bush tax cuts. The utter thought that John McCain will, in all likelihood, be the Republican nominee is beyond chilling. This, without hesitation--is truly a sad day for the GOP.